Bracelets There are 36 products. A stunning filligree metal cuff bracelet beautifully juxtaposed by sparkly gemstones and classic pearls, together they form a truly eye-catching statement cuff that shimmers beautifully in the light. Stunning and lovely, this modern pearl cuff features white or black peacock freshwater pearls with silver or gold plated copper. A real modern statement bracelet. 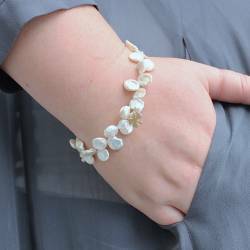 This pretty handmade pearl bracelet is so versatile it can be worn with anything. It has a silver coin with white freshwater rice pearls on a two strand silver chain finished with a heart clasp. This pretty and delicate silver heart bracelet has a pearl and crystal cluster charm in many colours on a sterling silver link chain, and is finished with a pretty heart clasp. 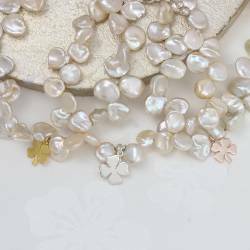 This beautiful white baroque pearl charm bracelet can be personalised to create a unique keepsake gift for special occasions such as Confirmation, Weddings and Easter.